The Partisans Martyrs Cemetery Monument, Velania (Pristina). 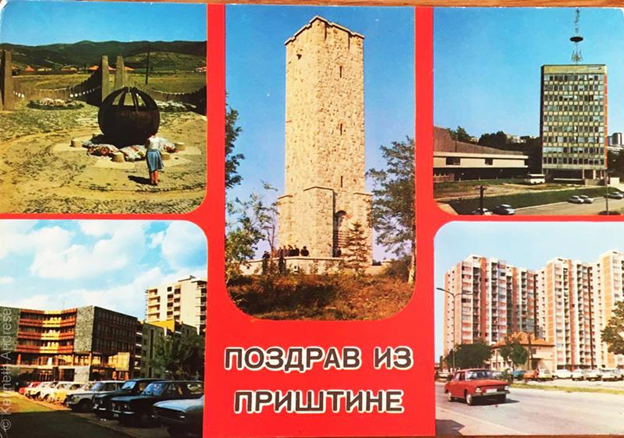 The Partisans Martyrs Cemetery Monument is located in Velania, the highest part of Pristina. 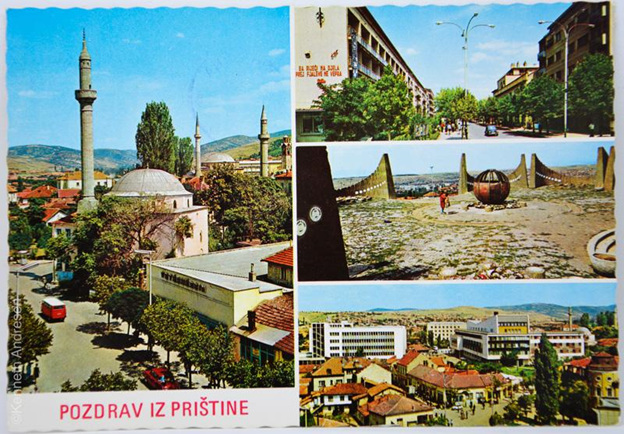 In the postcard dating back to the 1960s, 1970s and 1980s, it appears standing alone or with other views of the city of Pristina. Where it stands alone, its image sends mixed messages of architectural grandeur and pastoral spirit. 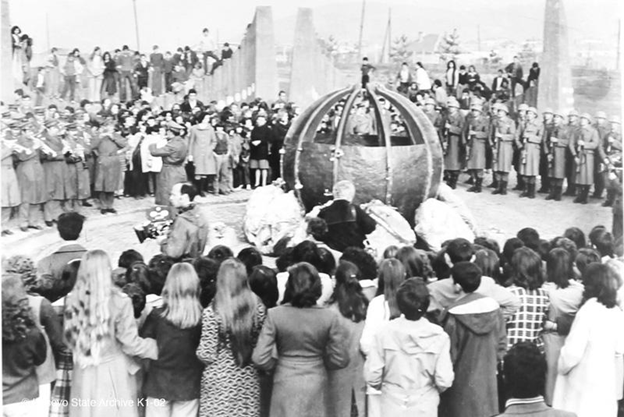 The viewer is immediately captured by the eight large, concrete semi-circles, shaped like open arms, surrounding a ball-like large shape, made of metal beams. On the inside walls of the semi-circles there are white medallions, representing individual fighters (163) or civilian victims (58) of the war. The monument sits on a grassy hill, whose elevation from the city is clear from the backdrop – a distant urban landscape down below, framed by mountain. But because of the presence of children playing and people conversing with each other, this heavy structure of concrete and metal is offset by mundane views of ordinary life. 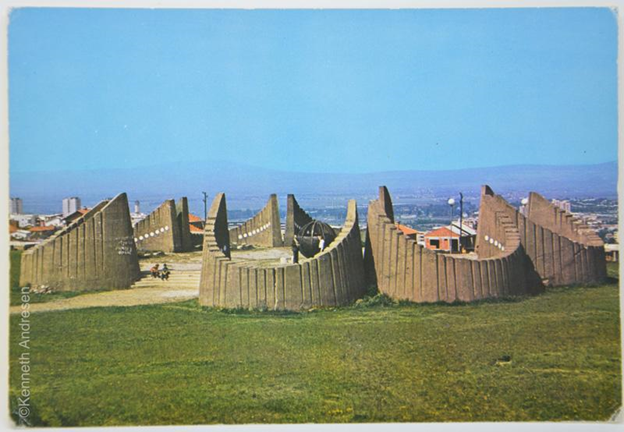 Here too, like in Landovica, the memorial betrays its use as a recreational structure, among others. 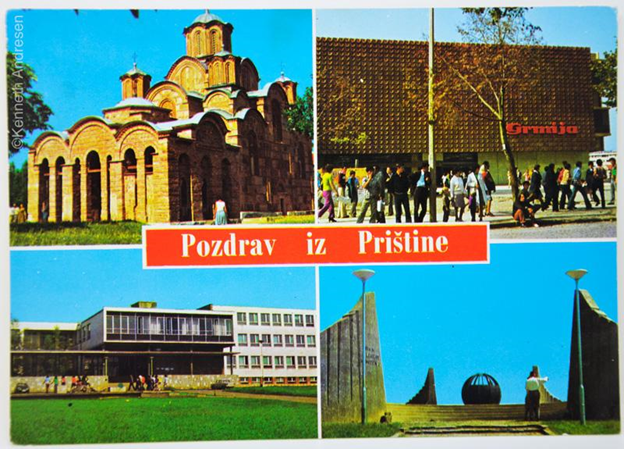 In many postcards, the Velania memorial sometimes appears exclusively with other modern, postwar views of the center of town: the building of Radio Pristina; the National Theatre; the new apartment buildings in Dardania; the Department store Grmija on the pedestrian street, the korzo; the University campus; the monument Brotherhood and Unity; the hotel Božur [now Hotel Swiss Diamond], with its colorful illustrated wall, and the slogan, “From Words to Actions” in two languages. 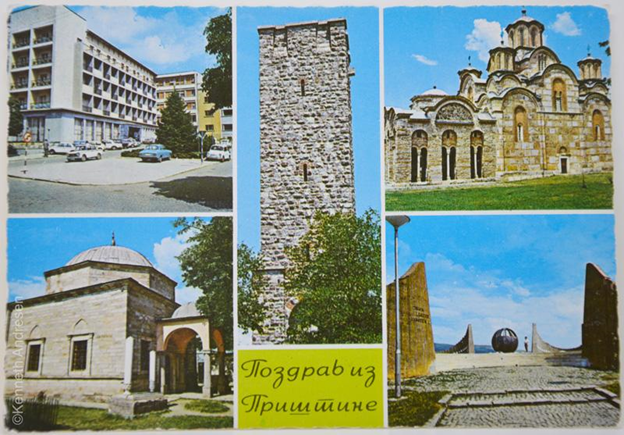 In other postcards, the Velania memorial is accompanied by the other two stronger signifiers of Pristina’s different identities: the historical heritage sites of the Serbian Church in Graçanica/Gračanica and the Ottoman turbe in Mazgit, both out of town. The Partisans Martyrs Cemetery memorial in Velania, designed by Svetislav Ličina, (Zagreb 1931), and completed in November 1961 over a park of 3 hectares, still stands today, though looted of its medallions and in a state of neglect. 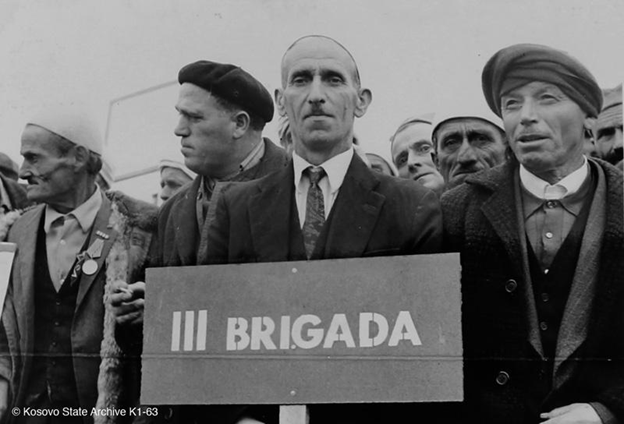 It was never threatened with destruction, perhaps because of the advocacy of the last surviving veterans of the Anti-Fascist National Liberation War, who managed to add a new plaque after 1999, and rededicated it to the 220 martyrs of the Second World War. And in good weather, kids regularly play among the ruins of a once majestic work of architecture, as they used in former times. Another reason for its longevity might be that it is located on hallowed ground. In its vicinity, another cemetery has been established after 1999, this one dedicated to the fallen of the Kosovo Liberation Army in the recent war, as well as the tomb-mausoleum to Ibrahim Rugova, the first president of self-governing Kosovo, deceased in 2006. The sentiments elicited by this monument were not always neglect and disinterest. 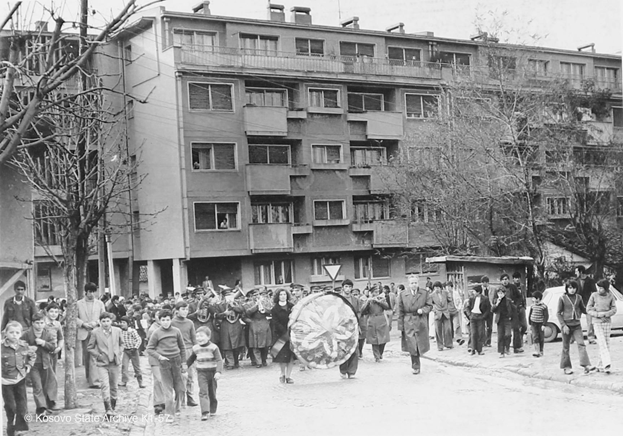 Archival photos of the thirtieth anniversary celebration of Pristina’s liberation from the Nazi occupation, in 1974, show its popular appeal, beyond the veterans’ groups. 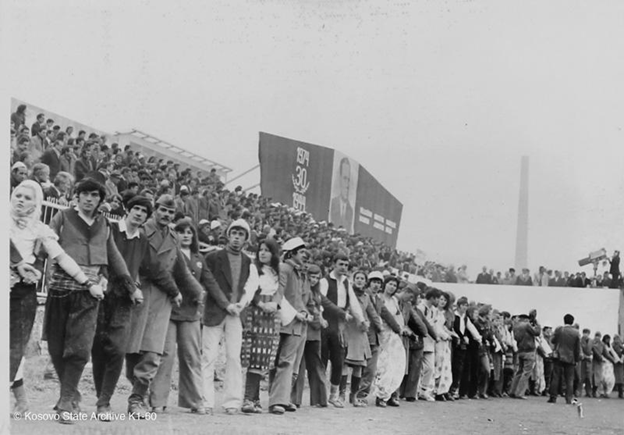 It was then another strong symbol of brotherhood and unity, as the gigantic backdrop of the ceremony reads, in Serbian, Albanian and Turkish, next to Tito’s portrait.